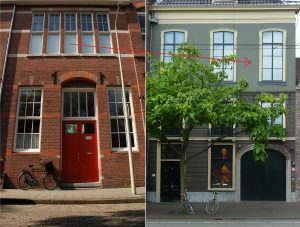 After working on the preparatory stage of the Diogenes painting, today it is due time to transport the painting from the Conterfeyter studio to the Galerij Prins Willem V in the historic part of town. 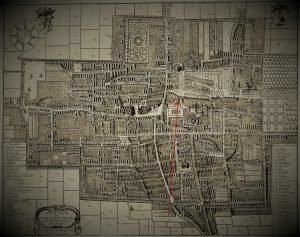 This eighteenth century map of ‘s Graven-Hage (nowadays called Den Haag) shows the location of the studio, which by now is very much part of the city centre, at that moment still being pasture outside the town’s limits. It is not unthinkable that Paulus Potter’s famous bull has grazed here somewhere. 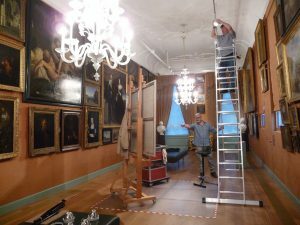 Together with the painting at its preliminary stage, various parts of the studio equipment have to be transported too, because the museum gallery will be the in-situ studio for the Conterfeyter painter for the coming three weeks. But no worries, when he is looking around, he gladly admits feeling ‘locked up in a true candy store’. After setting up his large studio easel, the floor protection plates and the material cabinet at the working space in the middle of the gallery, thanks to the museum’s very helpful coordinator of exhibition technology some extra lighting shining on the canvas is installed as well. Tomorrow the actual painting will finally start.